Are you ready for the sweetest escape this summer season? Speed elevates your travel from great to extraordinary with some tips, tricks, and the right tech recommendations. Plus, travel like a pro with Speed’s ultimate travel gadget kit. Trending on the cover of Speed April 2019 is Alex Gonzaga. Enter her fun and crazy world, and trace back her journey to becoming a social media star and an unstoppable force in the cybersphere. Heat up your summer with fresh-from-the-oven products, starting with the Huawei Mate X, Samsung Galaxy S10, Sony Xperia 1, Canon EOS RP, Toyota Hiace, Volvo XC40, and more. Plus, get your monthly dose of mobile devices, laptops, cameras, apparel, shoes, cars, and bikes. Celebrate Sony Walkman’s 40th year with a look at some of its most iconic models. Exclusive on Speed: Interview with Shazam actor Zachary Levi. Plus, esports caster and analyst Em Dangla shares her beginnings in the field and her roots as an avid mobile gamer. Ready, jet set, and go! 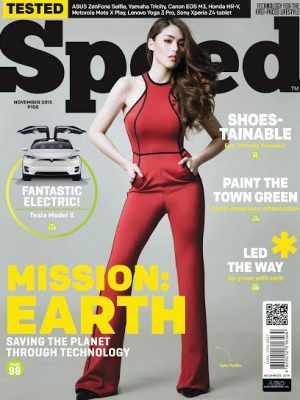 Grab a copy of Speed’s April 2019 issue from your favorite bookstore, or download a digital copy from Buqo (bit.ly/SpeedMagBuqo) or Magzter (bit.ly/SpeedMagzter). To find out more, visit speedmagazine.ph or facebook.com/SpeedMagazinePH, subscribe to youtube.com/speedmagazineph, follow @SpeedMagazine on Twitter and Instagram, email [email protected], or call (02) 374-6771 to 75.